A dense fog advisory for the area was forecast until 9am this morning. Staying up late last night led to a dense fog event inside, too, when I arose late! 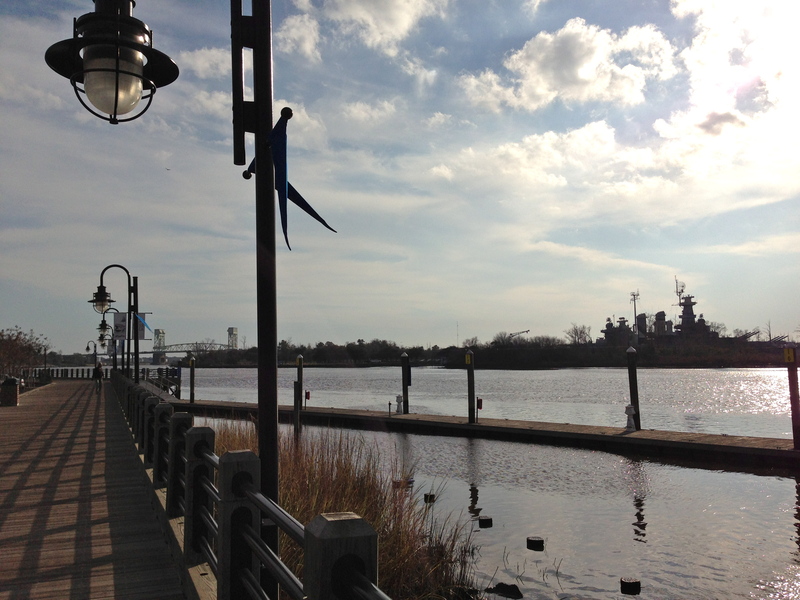 The weather changed today and it was a balmy 70 degrees with sun as I left to learn more about downtown Wilmington. The historic downtown retains some brick streets, more brick buildings, and small alleyways all moving straight up from the Cape Fear River in a grid. There are large hotels on the river, which block views and take over the landscape, but for the most part, downtown is an interesting mix of retail, bars, hip eateries, tattoo parlors, and movie sets. Later as I paged through the tourist literature, I learned that military personnel, college students (there are two colleges close to downtown – University of North Carolina – Wilmington and Cape Fear Community College) and alcohol when mixed at bar closing time lead to police intervention. The recommendation was to avoid certain areas of downtown at that time of night. After walking around the area, I can understand how those different forces could come together and ignite in the wee hours of the morning. I was not prepared to have a Wilmywood experience. 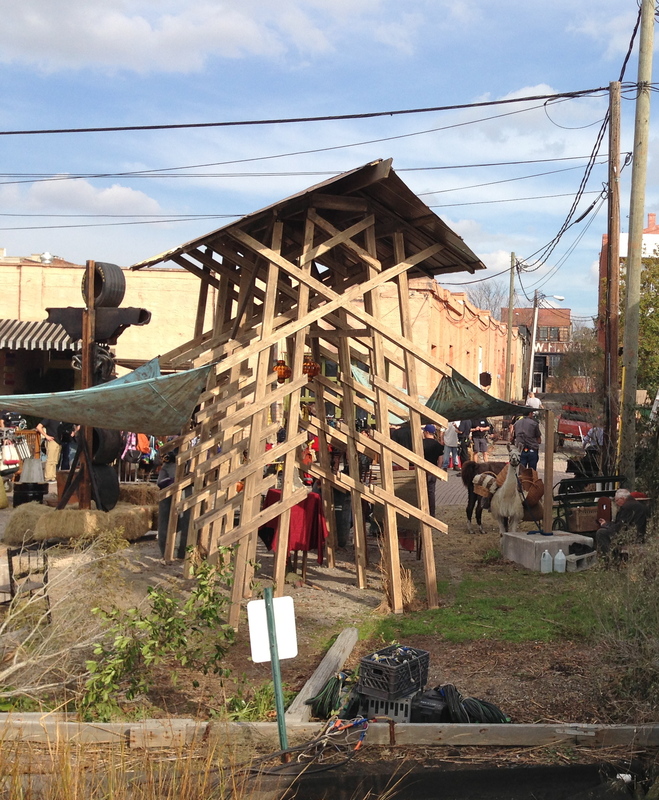 The area has an active film industry, and is the filming location site of many television shows and movies. Homeland is filmed here and I learned today from a bystander that a “post apocalyptic thing, not too good, but at least they got another season” is filmed here, too. 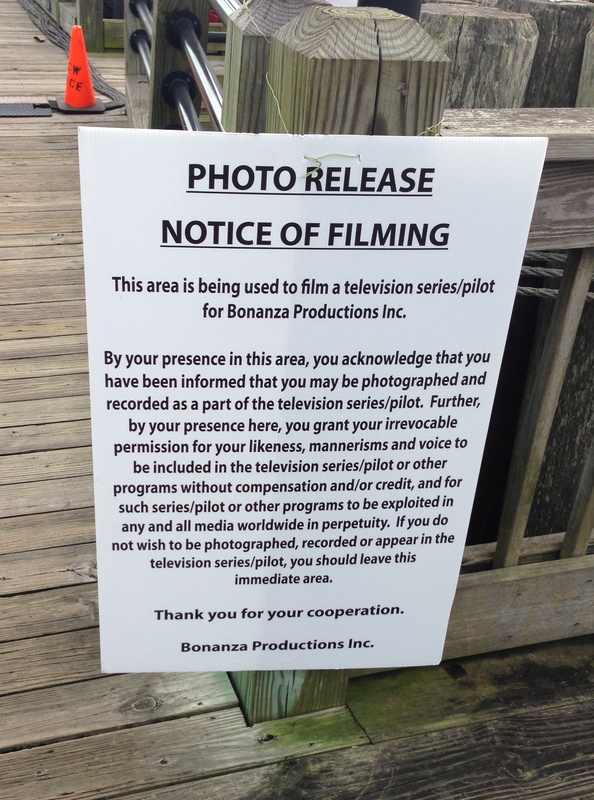 In fact they were filming today. 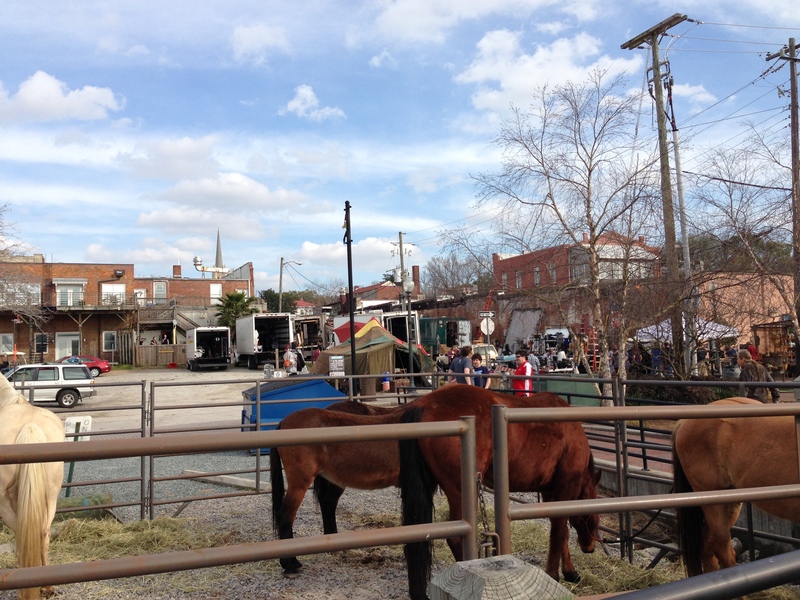 I don’t think I was in any of the shots, since what I saw was the moving of equipment from one part of the area to another, but it was curious to see llamas, horses, plastic butchered meat hanging from a tent, and other props built for the scene. 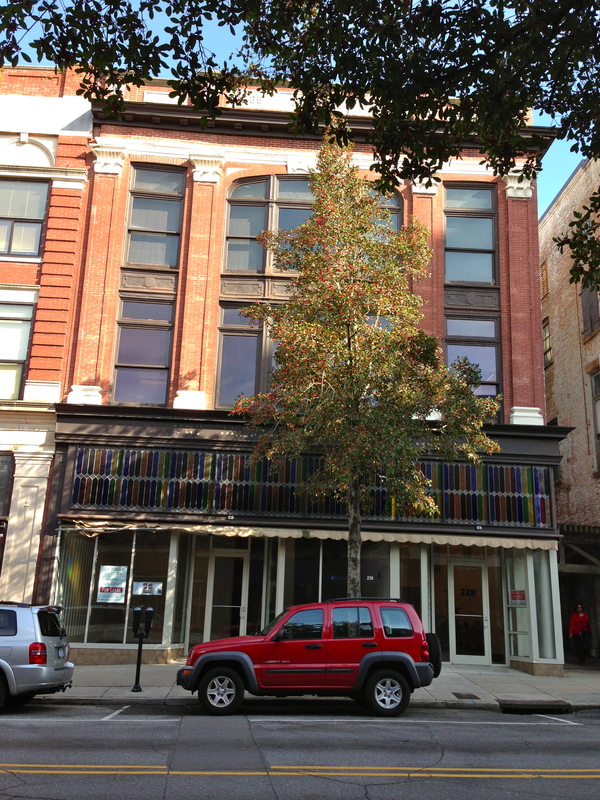 Stopping in an artist’s coop gallery located in the Cotton Exchange (historic, haunted building) yielded a wonderful conversation with a metal smith/jewelry maker named Sara Westermark. Yes, her husband is Swedish, too. Originally from St. Louis, she has grown to love Wilmington and its artist community, restaurants, size, beaches, and sense of place. Thanks Sara for the time and convo, maybe a collaborative project is possible! Her cohort, Sybil, too is an advocate for Wilmington; a town they both say has a lot of “newbies,” who are welcomed. A stop in the New Elements Gallery yielded more convo about downtown and its greatly supported monthly Art Walk events, and the energy of noise that is exploded after the bars close. The Port of Wilmington, the flow of water in the Cape Fear River allowed access to materials needed for the city to grow. When blockade-runners were successful, citizens received goods before cities further up river. Walking the mile long River Walk, the river is approachable, almost gentle, belying its past as witness to slave ships and riots. I feel a churning underneath my placid exterior, the “where?” decision time is drawing near and there is much more to learn, including trusting the current of my soul.